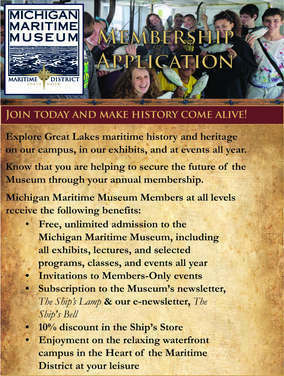 Memberships sustain the Michigan Maritime Museum and allow the Museum to offer continuing education programs. As a non-profit 501(c)(3) organization, we have a variety of membership levels that offer valuable benefits. Pride in your support of the Michigan Maritime Museum's educational mission and the knowledge that you make a difference! Would you enjoy crewing on a tall ship, telling stories, working with children, or meeting new people? If you like gathering with others to discuss shared interests and would like to help preserve Michigan’s Great Lakes maritime history and culture, then the Michigan Maritime Museum needs your help. Volunteers make all the difference at the Michigan Maritime Museum! Would you like to share your time and talents? To learn how you can get involved, please visit our contact request form and check the Volunteer box under areas of interest. You may also fill out the Volunteer Interest Form below and return it to volunteer@michiganmaritimemuseum.org. Preserve Great Lakes waterways, maritime history, and culture with a gift to the Michigan Maritime Museum. With your help we will become a nationally renowned maritime research, preservation, and educational center that is financially viable, dynamic and inviting, meaningfully serving the broadest possible public. By donating to the Michigan Maritime Museum, you keep Michigan’s Great Lakes maritime history alive. Gifts are tax-deductible and you receive the satisfaction of knowing that you are safeguarding the maritime heritage of Michigan’s Great Lakes for generations to come. Express your sympathy or remember a loved one through a Memorial Gift. Celebrate a wedding, birthday, anniversary, birth of a child, or graduation through a Tribute Gift. A Memorial or Tribute Gift to the Michigan Maritime Museum is a meaningful way to recognize friends, family, and business associates. We appreciate any donations offered to the Museum large or small. For information on how to make a gift by matching Foundation opportunities, wire transfers, or through stocks and securities, please contact the Executive Director. We invite you to join us in ensuring the future of the Michigan Maritime Museum as you consider leaving your own maritime legacy. We would be honored to work with you on planned gifts such as bequests, insurance policies and retirement accounts. If you would like more information on how you can leave your own maritime legacy, contact Patti Montgomery, Executive Director. For information about donating an artifact to the Museum, please contact the Collections Manager or call 269-637-9156.